There’s no getting around the fact that costly upgrades are needed for Allentown’s more than 600 miles of aging water and sewer lines. Over the next 45 years, LCA expects to spend $1.3 billion on infrastructure improvements in the city. But Allentown and LCA aren’t alone in this struggle: Communities across the country face the same problems. The fact is, our nation’s water and sewer infrastructure system is old — in some places, lines have been in use for more than a century. And because repairs and upgrades have repeatedly been put on the back burner — in the city and across the country — that water infrastructure is failing. 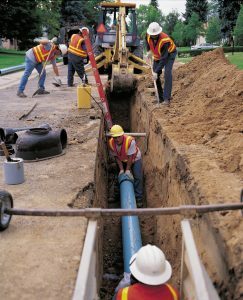 While water main breaks, leaks and outages are among the most obvious — and commonplace — symptoms of the failing infrastructure, there are health and safety aspects to the problem, too: Leaks and breaks can allow contaminants to enter already treated drinking water before it reaches the tap, and some of those old lines contain lead. USA Today reports that more than 2,000 water systems across the U.S. have lead levels that exceed federal limits. Additionally, experts say updated water quality tests and treatment systems are needed to detect and remove new and emerging contaminants that weren’t a concern in the past. Some of these stem from chemicals contained in household, industrial and agricultural products that can cycle back into drinking water supplies. In Los Angeles, Calif., water main replacement will likely cost more than $1 billion over 10 years. From 2006 to 2015, crews responded to about 13,000 leaks — approximately 4 breaks a day — across the city, according to the Los Angeles Times. In Menlo Park, Calif., it will take $90.3 million to update the municipal water system infrastructure between now and 2040. In New York City, a plan to spend $3.4 billion over five years is already in place, and is already making a difference: AM New York reports that “the number of water main breaks per 100 miles dropped from eight in the 2015 fiscal year to 6.1 in the 2017 fiscal year.” The national average is 25 breaks per 100 miles, according to the American Water Works Association. In Massachusetts, a $100 million interest-free loan program is earmarked just for replacing some 28,000 lead-containing water lines across the state — including at least 3,500 lines in Boston. That’s on top of a $210 million loan program to upgrade the state’s water infrastructure over the next decade. In Pittsburgh, it’s estimated that at least $5 billion worth of infrastructure improvements are required. And that number doesn’t cover replacing lead lines — which is expected to cost the city another $411 million. Water main breaks and boil water advisories are commonplace in Pittsburgh, and lead levels exceed EPA standards. Water customers are facing rate hikes of 50 percent over the next three years to cover the costs. And just on the outskirts of the city, the Municipal Authority of Westmoreland County is looking at water infrastructure repairs and upgrades totaling around $100 million. Closer to home, Philadelphia is scrambling to repair its aging lines. It experienced “715 water main breaks from July 2016 through June 2017, a volume of water service disruptions that brought potential flooding to approximately 700 neighborhood blocks,” according to a story in the Philly Voice. And this past winter, there were 625 water main breaks in a three-month period alone. The city faces a $4.5 billion price tag, spread out over 25 years, just for a program to reduce stormwater pollution. Water main replacement, sewer main upgrades and meter replacements will cost even more. LCA’s move to raise rates and institute monthly billing to help, in part, defray the cost of repairs to Allentown’s water and sewer infrastructure has, understandably, caused concern. But the cost of doing nothing now is much higher than the cost of delaying these repairs any longer.